Paper mill can use virgin pulp, recycled paper, de-inked pulp as raw materials to produce high-grade cultural paper (like A4 paper, writing paper, printing paper, etc.). Firstly，waste paper is conveyed to ZSC4 D type hydrapulper by BFW1200 chain conveyor for pulping. Secondly,the paper pulp will be conveyed into automatic deslagging device ZSC4 high density cleaner to remove heavy impurities like staples, stones, glasses, etc. in the paper pulp. Third, ZM450 Conical refiner and ZDP450 Double disc refiner will be used in series to improve breaking degree of paper pulp. Then, ZNS0.6 mid consistency fine screen will be used for fine screening of impurities exist in the paper pulp. Lastly, the paper pulp will be conveyed into NLS0.6 inflow pressure screen for paper making. 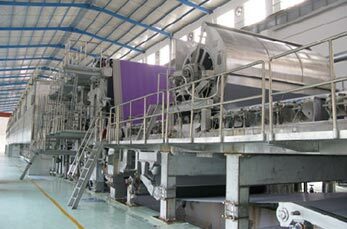 Leizhan culture paper machine has a width range from 1880mm to 3750mm and a bsis weight range from 40g/m2 to 80g/m2. With operating speed range from 200m/min to 1200m/min, Leizhan cultural paper manufacturing device can produce 20-270 tons of fine cultural paper per day.